Review: Marley Gibson puts Radiate, an inspiring story on the table when she brings the main character Hayley Matthews to life. Her first three years of high school, she's a 'nobody.' And now that Hayley's a senior she seeks out to get the most out of high school. How does she decide to do this? Try out for the PHS Varsity Cheerleading squad! And she makes it! Now over-night it seems as if the popularity fairy has doused her with instant popularity, everyone knows her name! But soon, Hayley finds out she has malignant tumor in her leg. She spends the rest of her summer and senior year dealing with the side effects, like losing her hair, losing her friends, and all her insecurities. It all starts off the summer going into senior year in high school. Hayley tries out for varsity cheerleading, and she's one out of twelve girls to make it, against the odds. All summer its practice by day, and crazy parties by night. She becomes best friends with her stunt partner Lora, and falls for the cutest guy at PHS Daniel, while regaining her friendship with her old childhood friend, Gabriel. Then, Hayley finds a lump in her leg. When she gets to the doctor's office, it's a malignant tumor, causing cancer. The rest of her summer she's in the hospital. Getting poked at, cut open, tested and studied. After a few surgeries, the tumor is removed, and must undergo radiation, which leads to some side effects that she's embarrassed about. And when Hayley returned back to school everything seemed to change. People stare at her like she's an alien, or treat her like a baby, but she doesn't want any of that, she just wants the senior year she's always dreamed of. I thought this book was very good, even though sometimes the character Hayley annoyed me. Throughout the book, she was in danger of losing her life, and all she would care about is cheerleading. Another thing I didn't like too much were some over-used, out of the ordinary phrases the characters used (example: super-juiced.) Other than that I thought it was well written, easy to follow, and the characters were likeable. The story was very inspiriting and could probably help teenage girls (and maybe even boys) get over the struggle of cancer, and just fitting in. 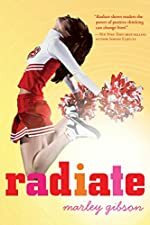 Over all I'd give Marley Gibson's Radiate 3.5 out of 5 stars. Review written by Samantha (7th grade student). We would like to thank Houghton Mifflin Harcourt for providing a copy of Radiate for this review. Have you read Radiate? How would you rate it?